That is awesome about your 1,000 for time. I am so impressed. Did you see the Phelps interview on 60 minutes last night? He described the horrid workout of 10,000 for time. Isn't that sick! That is FANTASTIC - way to go on your 1000! Welcome back Bri! Those workouts - the ones where the coach refuses to tell you until AFTER you've committed and jumped in the water- are the worst. Way to stick it through! Awesome 1000 Bri!! And that pace off of not that much training - just wait until you really get the training started and going - you will be RACE ready! :) I hope the run went well after work - hope that calf behaved!! BRI! nice swim!! Yippe! 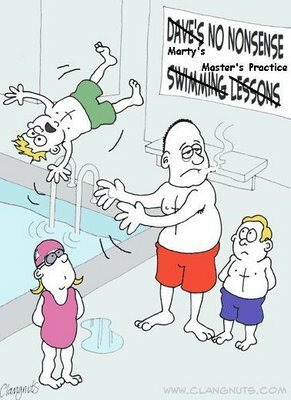 Hey, a gal I coach near you is going to email you....her name is Kari M....I just sent her your email, fyi...I want her to swim w/ your masters team!!! So, be nice...Marty, I mean. :) thank you in advance. Jen H.